Now that Michael Bisping has been eliminated from title contention by Vitor Belfort, the UFC middleweight division has become muddled with few options left for Anderson Silva. He has already knocked out Belfort in devastating fashion, Chris Weidman isn’t a PPV draw and is coming off recent surgery, and Silva has beaten most of the other viable candidates left except Hector Lombard and Luke Rockhold. However, a different name is beginning to pick up steam regarding a potential opponent for Silva even though he has another fight lined up in a different weight division. 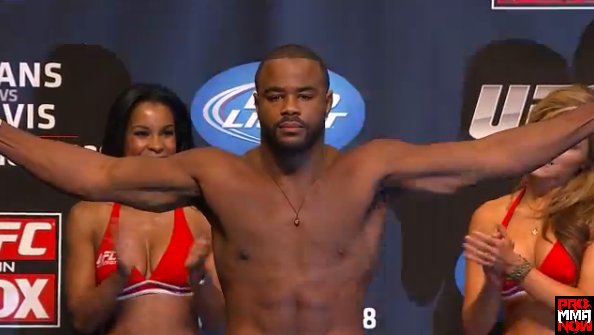 Former UFC light heavyweight champion Rashad Evans. Evans will fight Antonio Rogerio Nogueira at UFC 156, but could make a move to the UFC middleweight division under the right circumstances. He has already lost to former training partner and foe Jon Jones, so the likelihood of earning another title shot there is pretty small. It has long been thought that Evans could cut weigh and make the drop to the middleweight division, but Evans say’s it’s not as easy as it looks. However, that’s not to say that the thought of fighting Anderson Silva doesn’t add fuel to the fire to make that lifestyle change as Evans would be open to the challenge. He’s correct in that his skill set poses some problems for Silva, most notably his wrestling ability and top game coupled with good submission defense. However, he would be giving up a sizable reach advantage and would have to worry about take huge damage while trying to close the distance for a takedown. A fight with Silva would do two things. It would give Silva a credible opponent, and would allow him to make a considerable amount of money because Evans is a decent PPV draw. The latter seems to be the driving force with Silva regarding who he fights nowadays. Let’s see what happens at UFC 156 and if the move to middleweight picks up steam in the coming weeks.